City Hall Plaza in Boston, Massachusetts, is a large, open, unadorned public space in the Government Center area of the city. The architectural firm Kallmann McKinnell & Knowles designed the plaza in 1962 to accompany Boston's new City Hall building. The multi-level, irregularly shaped plaza consists of red brick and concrete. The Government Center MBTA station is located beneath the plaza; its entrance is at the southwest corner of the plaza. The siting of the plaza, the City Hall, and other structures in Government Center was the responsibility of I. M. Pei, commissioned by Edward J. Logue, then development administrator of the Boston Redevelopment Authority. The plaza and City Hall were constructed between 1963 and 1968, on the former site of Scollay Square, which despite its vibrancy and historical interest, was considered a seedy area by some. Other streets removed to make way for the plaza included Brattle Street and Cornhill. The 1962 design was reportedly modeled after Piazza del Campo in Siena, Italy. Reaction to the plaza has been mixed. Some praise City Hall Plaza for being cleaner and more appealing than Scollay Square, and for the simple fact that it was built at all—with the cooperation and compromises necessary of any complex, multi-agency government construction project. Architecture critic Ada Louise Huxtable called the plaza "one of the best urban spaces of the 20th century. ... With the plaza, and specifically because of it, the Boston Government Center can now take its place among the world's great city spaces." The Cultural Landscape Foundation listed the plaza as one of its "Marvels of Modernism." Others dislike City Hall Plaza for its anti-social aesthetic and failure to address unpleasant weather effects (such as wintertime cold, wet, and wind, and summertime heat, dust, sun, and wind). The Project for Public Spaces ranked it at the top of the organization's list of "Squares Most Dramatically in Need of Improvement in the United States" in 2005, and has placed the plaza on its "Hall of Shame." A fountain was built at the northwest corner of the plaza as part of the original design. But it was shut down in 1977 because water was leaking into the Blue Line subway tunnel below. The fountain was covered over with a concrete slab in 2006. Since the plaza opened in 1968, ideas for improvements to the public space have been put forth by citizens, students, architects, politicians, and others. Boston Mayor Thomas Menino had several ideas for improvement. In 2007, Emerson College students used the virtual world Second Life to re-imagine a better design. The project was sponsored by the Boston Redevelopment Authority, among others. A 2011 study commissioned by the United States Environmental Protection Agency made recommendations for the "greening" of the plaza. Work began in 2011 on plans to redesign the plaza and the Government Center MBTA station. The new MBTA station opened in March 2016 after two years of construction. Extensive landscaping and accessibility improvements to the adjacent areas of the plaza were completed in 2017. Nearby Boston Common has long been used for public events, including a 1969 peace rally that drew an estimated crowd of 100,000 and the 1979 mass celebrated by Pope John Paul II. But damage to the park from such large events led city officials to limit future events on the Common, relocating many to the paved City Hall Plaza. Annual events held on City Hall Plaza include Boston Calling Music Festival (from 2013 through 2016), Big Apple Circus, The Jimmy Fund Scooper Bowl, the Boston Pride Festival, the African Festival of Boston, Boston GreenFest, Boston Techjam, the Puerto Rican Festival of Massachusetts, the finish line of Hub on Wheels, and the Boston Cycling Celebration. Occasional events on the plaza have included Boston's 350th birthday celebration, art exhibits such as Strandbeest; large rallies in honor of the New England Patriots, the Boston Red Sox, and the Boston Bruins; political demonstrations; an exhibit of "street pianos"; beer festivals; HUBweek, a pizza festival, the Boston Night Market, and a "Roller Disco Tribute Party". The Plaza has also been the site for many free concerts including being the original site (before moving to the Hatch Memorial Shell) for WODS (Oldies 103.3) summer concert series such as Chubby Checker and Paul Revere & the Raiders. From December 2016 until February 2017, the Plaza opened an outdoor Skating Path and Holiday Market. The Skating Path provided skating lessons for different age groups and planned themed skating events. ^ "Planning Models - Boston City Hall Plaza". FAH 198-05 Government Center. Tufts University. Retrieved 24 March 2016. ^ "Boston City Hall Plaza". Cultural Landscape Foundation. Retrieved 14 January 2017. ^ The good city: writers explore 21st century Boston. 2004; p.4. ^ "Project for Public Spaces". ^ "City Hall Plaza - Hall of Shame". Project for Public Spaces. Retrieved 20 March 2016. ^ "Mayor Martin J. Walsh blasts city's property management chief on City Hall Plaza repairs - The Boston Globe". BostonGlobe.com. Retrieved 2016-04-07. ^ "Boston's City Hall Plaza Now Features a Concrete Slab - Project for Public Spaces". Project for Public Spaces. Retrieved 2016-04-07. ^ "Reimagining Boston City Hall Plaza Using Second Life". YouTube. Retrieved 14 January 2017. ^ "Greening America's Capitals: Boston's City Hall Plaza" (PDF). epa.gov. Environmental Protection Agency. Retrieved 23 March 2016. ^ Moskowitz, Eric (21 March 2016). "Government Center shines as it opens again". Boston Globe. Retrieved 23 March 2016. ^ "MBTA Government Center Station + City Hall Plaza". Halvorson Design. Retrieved 3 September 2017. ^ "The 1969 peace rally". The Boston Globe. 17 October 2012. Retrieved 5 April 2016. ^ "Pope John Paul II visits Boston". The Boston Globe. 3 October 2012. Retrieved 5 April 2016. ^ Drake, John C. (20 March 2008). "Large events may become uncommon at city's beloved park". The Boston Globe. Retrieved 5 April 2016. ^ "Boston Pride Festival". Bostonpride.org. Retrieved 5 April 2016. ^ "African Festival of Boston". Retrieved 5 April 2016. ^ "Boston GreenFest". Retrieved 5 April 2016. ^ "Boston TechJam". Retrieved 5 April 2016. ^ "Puerto Rican Festival of Massachusetts". Retrieved 4 September 2017. ^ "TD Hub on Wheels". Retrieved 21 September 2017. ^ "Boston Cycling Celebration". Retrieved 5 April 2016. ^ "A look back: Boston's City Hall Plaza". Boston Globe. 20 September 2013. Retrieved 13 April 2016. ^ "Strandbeests come to Boston". The Boston Globe. 28 August 2015. Retrieved 5 April 2016. ^ Schworm, Peter (26 January 2015). "Showing true grit, Pats' fans rally in Boston". The Boston Globe. Retrieved 5 April 2016. ^ "Playoff rally at City Hall". The Boston Globe. 1 October 2007. Retrieved 5 April 2016. ^ Nguyen, Rosa (7 August 2015). "Civil rights groups protest federal program to combat extremism, saying it targets Muslims". The Boston Globe. Retrieved 5 April 2016. ^ "Supreme Rally for Women's Equality at City Hall Plaza". Boston Herald. 8 July 2014. Retrieved 5 April 2016. ^ "Street Pianos - City Hall Plaza". StreetPianos.com. Retrieved 18 April 2016. ^ Weaver, Alex. "City Hall Plaza Lands Another Giant Beer Festival". BostInno. Retrieved 20 April 2016. ^ "A Major Beer Festival Is Coming to City Hall Plaza This Summer". BostInno (25 February 2016). Retrieved 27 August 2016. ^ "For 1 Night Only, City Hall Plaza Becomes Your Go-To After Work Bar". BostInno. 10 June 2016. ^ "HUBweek". Retrieved 6 September 2017. ^ "Boston Pizza Festival". Retrieved 4 August 2018. ^ "Boston Night Market". Retrieved 6 September 2018. ^ Rosen, Andy (18 July 2014). "Roller disco event honors Donna Summer". The Boston Globe. Retrieved 5 April 2016. ^ "Boston Winter: City Hall Plaza Skating Path & Holiday Market | Boston Central". www.bostoncentral.com. Retrieved 2017-06-23. Peter J. Howe. Mayor has new spin for City Hall Plaza; Menino wants to explore wind turbine installation. Boston Globe, Sep 29, 2007. pg. A.1. Christina Pazzanese. Some small things could pretty up City Hall Plaza. Boston Globe, Sep 16, 2007. pg. 2. Matt Viser. Fount of futility finally runs dry; City Hall Plaza eyesore gets a concrete solution. Boston Globe, June 9, 2006. pg. B.1. Jack Thomas. 'I wanted something that would last': At 89, an architect stands by his plan for City Hall after four decades of both condemnation and praise. Boston Globe. October 13, 2004. Talk about City Hall Plaza. Boston Globe, Apr 12, 2003. pg. A.10. Thomas C. Palmer Jr. Effort to improve City Hall Plaza gets new life, group expected to deliver recommendations next year. Globe Staff. Boston Globe, Oct 1, 2002. pg. D.1. Sarah Schweitzer. An unfulfilled urban promise; Menino resurrects a plan to renovate City Hall Plaza. Boston Globe, Aug 8, 2002. pg. B.1. Robert F. Walsh. Some lessons on upkeep at City Hall Plaza. Boston Globe, Apr 15, 2002. pg. A.17. Improving City Hall Plaza. Boston Globe, Jul 17, 2000. pg. A.10. Anthony Flint. City Hall Plaza to get $27.5M renovation. Boston Globe, Dec 17, 1999. pg. B.3. A refuge on City Hall Plaza. Boston Globe, Dec 17, 1999. pg. A.26. Anthony Flint. City Hall Plaza redesign is OK'd; modest makeover to be announced. Boston Globe. Boston, Mass. : Dec 15, 1999. pg. A.38. Walter Muir Whitehill. Boston: a topographical history, 2nd ed. Cambridge, MA: Harvard University Press, 1968. 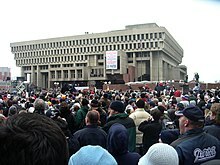 Wikimedia Commons has media related to City Hall Plaza (Boston). One citizen's hope for the barren wasteland of Boston City Hall Plaza. YouTube, 2007. Kevin McCrea exposes Mayor Menino giving away 300 million dollars at City Hall Plaza. YouTube, 2009. Urban Toronto. Discussion thread about Boston's City Hall.